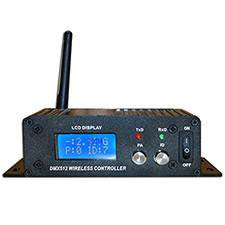 The Adkins Professional Lighting WiDMXTrans-LCD is a full-featured, easy-to-use wireless DMX system with 4 user-selectable power levels and 16 automatic or manually selectable channel groups. 2.4Ghz operation allows transmission distances of up to 400 meters under ideal conditions! 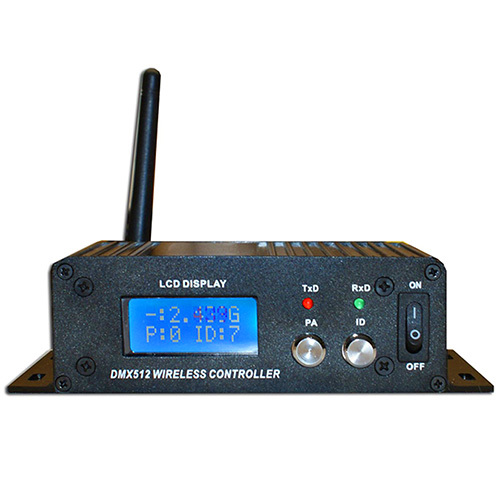 The WiDMXTrans-LCD Transmitter may be combined to allow up to 16 DMX universes to operate wirelessly in the same location. Plus, thanks to its LCD display, system status and adjustment is straightforward and quick. Finally, each WiDMXTrans-LCD is capable of operating as a transmitter or a receiver, which eases system design and implementation.